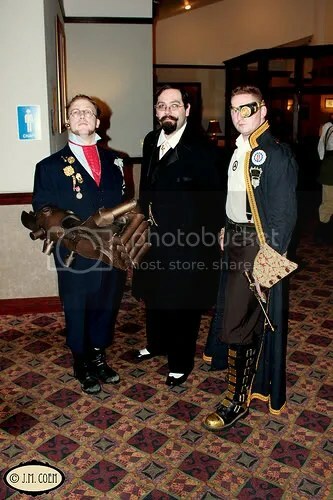 Austin, in the middle with the Emperor Justinian Stanislaus of the Red Fork Empire (left) and General Caled of The Wandering Legion (right). Image courtesy of Jessica Coen. As the opening credits of the convention rolled amidst bomb-carrying ravens, a firebombed London and a staged murder among the crew by poisoning, I had to wonder to myself, “What strange and wondrous world have I found myself in?” That world, of course, was TeslaCon, the first convention of its kind: an immersive, in-character steampunk convention in Madison, Wisconsin from November 5-7 2010. I’m no stranger to conventions – I’ve been a con-goer since my first Star Wars/Star Trek convention in the mid 90’s – but I’d never seen anything quite like this. TeslaCon, like steampunk itself, occupied a strange, liminal space between media and performance. Convention staff members spent the entire weekend in character, interacting with the attendees like at a murder mystery dinner while the plot slowly unfolded: an epic battle and race against time to save the airship on which the con took place before it was sabotaged and stolen by the nefarious Dr. Proctocus. Beyond the actual story of the convention there was also a wide assortment of programming available both in and out of character, and a frequent complaint that I heard while chatting with various attendees was that there were too many good panels scheduled simultaneously! Though of course, being a long-time attendee (and recent staff member) of Dragon*Con, I’m used to hearing that sentiment. Still, it’s the hallmark of a good convention. What really impressed me about this convention were the attendees. Many chose to not be in character for the weekend, but many others embraced the immersion with the full force of their being and made the event into something really special. At any hour of the day you could hear in-character discussions being had by all manner of people portraying all manner of personas. There were French characters, British, “Oriental”, dimension-travelers and many more. Some people I spoke to had different personas on different days, whereas others stuck to one for the duration. Ernesto Maldonado, for example, dressed as his own porter as he unloaded his luggage into his stateroom and changed into his more upper-class persona once he was unpacked. He later informed me that his porter had died in an explosion on board, and since the man had been “only a servant”, his body was chucked overboard. With characters like these attending the convention, it was no wonder that it quickly became my favorite event of the year, as anyone who follows my Facebook could tell. Since I’d been asked by Ay-leen to report on TeslaCon, I kept an eye out for multicultural costumes and characters this weekend. Considering how small the con was (it was purposefully capped at a low number to maintain the intimate feeling), multiculturalism was in full force! 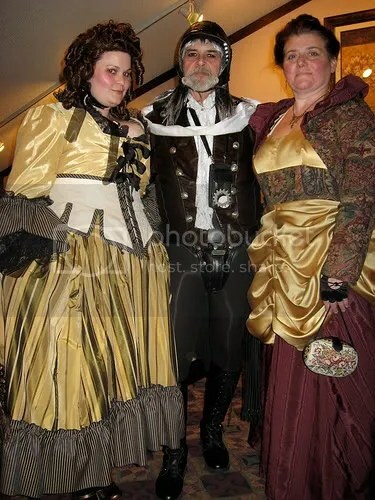 Unfortunately, as I was busy giving panels (most notably Gender and Race in Steampunk) I may have missed a number of costumes. However, I saw several Asian women wearing lovely costumes that were captured on film by my friend and Beyond Victoriana photographer Jessica Coen, as well as two Native American costumes that were extremely cool. 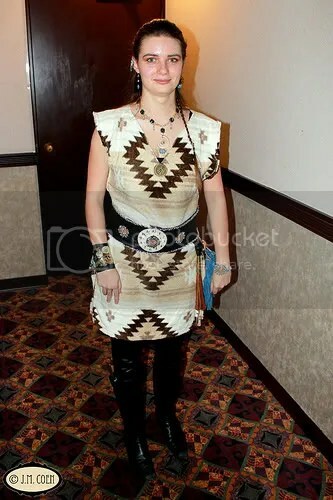 I had a chance to speak to one young woman wearing a Native American costume, Alison Smith. I discovered she was not actually of Native American ancestry but did an excellent job of treating the culture with the respect that it deserved, since she had actually gone quite far out of her way to make sure that the small details were observed, down to the jewelry, and was well-informed of the context in which her clothing fit. One of the many outfits doned by Capt. LaGrange. Image courtesy of Jessica Coen. 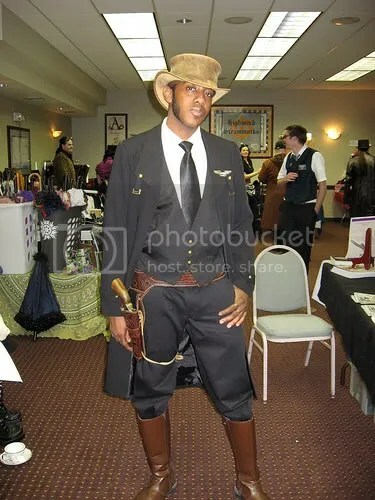 So far as I observed, there was, unfortunately, only one black man at the con, and it was the infamous Captain LaGrange of the airship Archon who, coincidentally, is one of the most attractive men I’ve ever seen in a corset. He can always be relied upon to provide excellent costumes, such as his wonderful steampunk Mojo Jojo at Dragon*Con this year. There was also the always-fashionable Samantha Rei, designer of Blasphemina’s Closet, who, like her own inherently multicultural history (she is biracial, as she informed the audience at my Race and Gender panel, and her black heritage is from Madagascar), enjoys mixing other cultures into her outfits such as when she sometimes incorporates an obi into her ensemble. I spoke to her at length about an upcoming costume idea she has for playing with the idea of race by doing a group costume involving racially-switched characters (i.e., the white characters would be portrayed by black costumers, and vice versa). I don’t want to give any more away, because she would likely crucify me for not keeping it under wraps until its debut! However, I find her idea of swapping cultural identities fascinating and I greatly look forward to seeing what comes of it. When done with the respect that I know she’ll put into it, it can’t help but be a learning experience for all of those involved. One costume that I sadly missed seeing was a woman dressed in a Berber-inspired steampunk outfit, complete with traditional beautification marks. I’ve heard second-hand that she was not culturally Berber (or some other related culture), and if that is the case, I heard from a number of people that she did an excellent job paying homage to the traditional Berber clothing. Hopefully our faithful photographer Ms. Coen was lucky enough to capture a picture of her. The Gender and Race panel ended up being an extremely interesting discussion that I wish could have gone on longer. My philosophy on discussion panels is that I absolutely don’t want anyone to take my words as the gospel truth, and that my real goal is to get everyone thinking critically about the issues at hand, especially if that involves questioning or correcting me. If you correct me enough, I’m likely to draft you into being a panelist next time around! For their part, the crowd did a wonderful job of participating, and I often had a hard time keeping up with the hands that were being raised. As my panelist in this case was Samantha Rei, we mostly spoke about the costuming and performative aspects of race and gender though I also added a few of my own personal experiences of interacting with the topics of race and gender as a white male. Primarily what this came down to was talking about how to deal with costumes that you’re worried might offend someone, or what to do when you unintentionally do offend someone. Altogether, I hope that the audience members left feeling more comfortable grappling with issues of gender and race than they did when they came in. 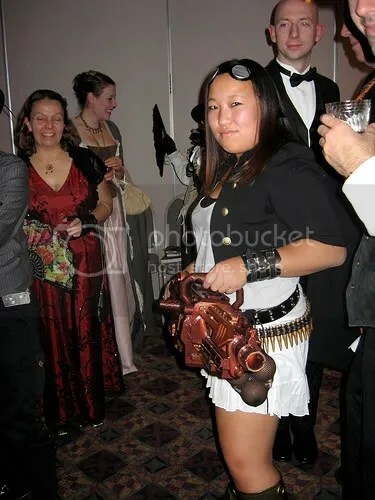 An Asian attendee with an epic gun. Image courtesy of Shannon Sofian. One interesting thing that came up during the panel was the fact that no one has any problem with the American people running around the convention all weekend speaking in caricatures of British or French accents (“Jolly day, my dear chap, how about some tea?”), but if a bunch of Americans were to run around spouting stereotypical African or Middle Eastern phrases in exaggerated accents, that may cause quite a problem. What it comes down to, of course, is power dynamics and privilege, but it’s still an excellent example of those dynamics being active right in the middle of our subculture with many not even being aware of it. Overall, this convention had a bit of everything that we’ve come to expect from steampunk conventions – panels on media, costume construction and academic pursuits, as well as bands, dancing, a fashion show and parties – along with an aspect that many of us didn’t even know we needed: immersion. It gave me, at least, a context in which to operate, and took away the slightly lost feeling I’ve had at other cons in the past where I would either feel slightly silly if I acted in-character, or slightly useless if I didn’t. At TeslaCon, I was technically as free to be or not to be in character as I am at any con, but because of the aforementioned context it gave all of us a common ground in which to meet, rather than all of us being off in our own little worlds. Based on my experiences this year, I would absolutely recommend to anyone interested in steampunk that they go next year. This con will only have a three-year run, with next year taking place aboard an imaginary submersible, and the third and final year taking place on the moon. As I said earlier, there’s an attendance cap so I suggest that you book a trip as soon as possible to avoid being left behind! Austin Sirkin is a graduate student at Georgia State University studying 19th Century Science Fiction. He uses his critical background to also study steampunk and speaks about it at conventions and conferences around the country. Additionally, Austin is also a prop-maker with Outland Armour and a director of AnachroCon. Such a glorious and wonderful review, Mr. Austin! Thank you for taking the time out to share your experience, as you absolutely love to share your views on everything. I think it’s only earnest of you to disclose that your wife was a guest of TeslaCon and you were treated to an above average convention experience because of it. In the manner of full disclosure and all. It is obviously an issue you feel very strong about, since you felt the need to call out a fellow blogger who wrote a glowing review of a film his friends worked on. Fair enough! I figured that it was enough that it was made quite clear both on the main page and in my review that I was a panelist, and was thus involved with the convention to some extent, but in the interest of fairness, I should have mentioned that my wife was a proper guest. I don’t feel that it exposed me to any particular extra bias because there were no special guest-only events or accommodations, but please, I encourage you to take my viewpoint with a grain of salt! I am, after all, only one man and am as prone to error and bias as anyone else. When considering whether or not to attend TeslaCon, I recommend that you consult multiple reviews, either the additional ones provided by Ay-leen, or ones on other websites. Thank you for your attentiveness!